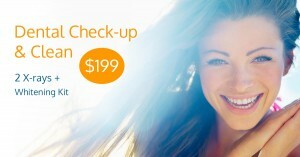 It’s important to us that you get the high-quality dental care you need and deserve. At Fortitude Valley Dental, we want to make sure that our dentistry is affordable and accessible for all. 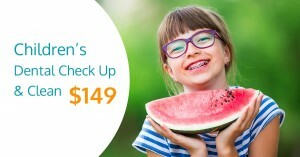 Your initial checkup is just $199* and includes a comprehensive examination, clean and polish and a take-home teeth whitening kit (or pay just the GAP with health insurance). This package is available for all new and returning patients. Includes: Examination, Scaling & Cleaning. Dental cleans can be covered by the Medicare dental benefits schedule for eligible children with no out of pocket costs. Feel free to send us an email via our Contact Us page, with the option to attach a picture to detail your problem. Weekend and late appointments are available. Schedule your time with our experienced, knowledgeable team today! Should you need any treatment then we will discuss a treatment plan with you on the same day. You’ll have plenty of time to ask your dentist questions and discuss all of the options open to you. We understand that you have a busy schedule and require care that can fit around your day. Our convenient location in the CBD makes it easy for you to work an appointment into your workday. We offer extended hours, Saturday visits by appointment and free parking. Schedule your appointment with our experienced, knowledgeable team now! *Please read our Terms & Conditions for all General Dental appointments.